Sultan Abdulhamid II, the 34th sultan of the Ottoman Empire, was remembered in Istanbul on Sunday, 101 years after his death. 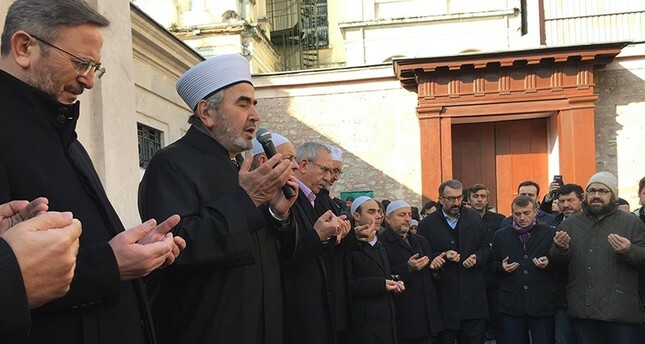 Abdulhamid II was commemorated in the city's Çemberlitaş district, where his gravesite is located, with a ceremony attended by many people, including Coşkun Yılmaz, Istanbul's provincial culture and tourism director, and the sultan's grandson Abdülhamit Kayıhan Osmanoğlu. Verses from the Quran were read out near his gravesite as part of the commemoration, and participants prayed for the late sultan. In a written statement, Parliament Speaker Binali Yıldırım termed Abdulhamid II as an "honorable state man," who served for both people and state for 33 years. Yıldırım said that the period in which the sultan faced his biggest challenges were also years of innovation and breakthrough for the Ottoman Empire in the fields of education and transportation as well as health and communication. "Sultan Abdulhamid II -- who was also accepted as the founder of the parliamentary system in our history -- passed away in Istanbul in the last days of the World War I after living three years in isolation in Thessaloniki," he said, adding: "I remember him with respect." Abdulhamid II, the son of Sultan Abdulmecid, died at Istanbul's Beylerbeyi Palace on Feb. 10, 1918. Abdulhamid II was born in Istanbul on Sept. 21, 1842. He spent his childhood and youth through the "Tanzimat," a period of reform in the Ottoman Empire that began in 1839. He was well-educated and spoke many languages, including French, Arabic and Persian. With his uncle Sultan Abdulaziz, he traveled through Europe and Egypt, which broadened his view of the world. He knew how to play piano and was also a talented carpenter who made furniture. Abdulhamid II ruled the Ottoman Empire for 33 years. When he took the throne on Aug. 31, 1876, the empire was facing serious threats both at home and abroad. The same year he came to the throne, on Dec. 23, he signed the first constitution of the Ottoman Empire, known as the Kanun-i Esasi, laying the foundations for constitutional government. Abdulhamid II excelled at foreign policy. He tracked political developments across the world closely and established an intelligence center at the palace. All of the articles written on the Ottoman Empire were brought to this center and reviewed by him. The sultan's main goal was to guarantee peace for the empire. Abdulhamid II also adopted a policy of pan-Islamism in order to oppose Western intervention in Ottoman affairs. In economic policy, he prioritized paying off external debts left from previous sultans. He signed an agreement with European creditors on Dec. 20, 1881, to pay off a significant portion of the debts. Abdulhamid II also took important steps in education. He opened many primary, secondary and high schools as well as schools for the handicapped and military schools throughout the empire. Darulfunun, later known as Istanbul University, was founded in 1900. Abdulhamid II was a generous man who could spend his own money when needed for state affairs as well as his people's benefit. Using his own money, he had Şişli Etfal Hospital and the Darulacaze Nursing Home built in Istanbul, both of which are still operating. In 1900, he ordered the building of a railway connecting Damascus to the holy cities of Mecca and Medina through Hejaz, Saudi Arabia. The railway line reached the holy city of Medina in 1908. Electric tramway lines were opened in many cities. Telegraph lines were set up through Hejaz and Basra, and highways were extended. He also placed great importance on sports. The three biggest clubs in Turkish football -- Fenerbahçe, Galatasaray and Beşiktaş -- were founded during his reign. On April 13, 1909, a group that was disgruntled with Abdulhamid's rule and sought the replacement of the monarchy with a constitutional government launched an uprising in Istanbul. The bloody revolt lasted 11 days. Abdulhamid II was deposed on April 27, 1909, after 33 years of rule and replaced by his younger brother, Mehmed V. On the same night he was dethroned, he was sent to Thessaloniki, in modern-day Greece, along with 38 people, including his family members. Three years later, on Nov. 1, 1912, Abdulhamid II was sent back to Istanbul, where he spent his last days at Beylerbeyi Palace, in the city's Üsküdar district.